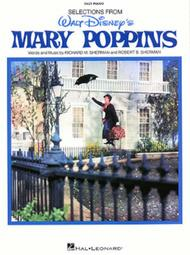 Mary Poppins - Easy Piano composed by Richard M. Sherman and Robert B. Sherman. For Piano/Keyboard. Easy Piano Vocal Selections. Disney and Movies. Difficulty: easy-medium. Songbook. Easy piano notation, lyrics and chord names. 40 pages. Published by Hal Leonard (HL.316018).ISBN 0793579317. With easy piano notation, lyrics and chord names. Disney and Movies. 9x12 inches.A delightful collection of 11 songs complete with a synopsis with color photos from the film. Songs include Chim Chim Cher-ee, Supercalifragilisticexpialidocious, A Spoonful of Sugar and more.